This past week on DCI.org, we've been examining the similarities and differences between drum corps and athletics. Like their collegiate counterparts, high school athletes also involved with drum corps find rehearsing and practicing for their respective sports and corps can be a time-consuming undertaking. Jamie Tucker of the Crossmen baritone line runs cross-country at Sherando High School in Stephens City, Va., and is also the catcher on the baseball team. "I have practice for either baseball (winter and spring) or cross country (fall) lasting two to three hours daily, five to six days a week. Baseball games last about three hours, we have two to four games a week plus the travel time. One of the "away" schools means two hours each way on a school bus," Tucker said. His cross-country career, meanwhile, means that his only "off" month is November. "Cross-country meets happen one or two times a week and last two hours plus travel time up to two hours each way. Cross-country season is August-November, baseball starts in December and goes through May, and drum corps tour season is May-August with all the practice time in the winter, too," Tucker said. In between athletic rehearsals, "I practice drum corps music about 30 minutes a day, four to five times a week at home or school. The time commitment is more in the early months when we are learning new tunes for the upcoming season and making sure I really do have a spot for the tour season. Then there's winter weekend camps, too," Tucker said. Joe Lewis, also a Crossmen baritone player, lives in Ellicott City, Md., and plays left wing on the hockey team. Although his team practices three or four hours a week, Lewis noted his state's unique problem and its affect on his hockey life: "Ice time is hard to find in Maryland, so the weekly commitment to hockey is pretty low," Lewis said, adding, "As for drum corps, I practice the music almost every day for no less than half an hour." Tucker said that his athletic and drum corps lives frequently conflict. "My coaches and directors want everyone at all practices for the whole time and I agree. But being up front with both about how important both activities are to me makes it a little easier. I give 110 percent-plus effort for the whole time I am with whichever group, and that shows my commitment to the activity," Tucker said. "And I practice on my own, too. I know there's always going to be a conflict and making the choice is never easy." Second-guessing his decision-making is a regular part of the day for Tucker. "I'm not always sure whether I am making the right choice, especially when both my coach and my director make it clear that once you make a commitment to being part of a team or group, you have to be there all of the time," he said. "It's hard to be in two places at the same time, especially when I live 3 1/2 hours from where the corps practices," Tucker said. The catcher resorts to some mental trickery to keep his practice life saner. "The thing is to focus on what I am doing at the time, not on feeling like I am supposed to be somewhere else at that very minute. Both high school sports and drum corps mean a lot to me so I try to talk to both sides and get their advice (and my parents) and hope I make the right decision. I've missed ball games and parts of winter camps just to make both work. And 2003 was the first time I didn't spent my summer playing baseball," Tucker said. Lewis, meanwhile, always concedes his hockey life to the Crossmen. "Two of the weekend camps this year caused me to miss games, but the Crossmen will always be a priority. If a player misses a game there are more than enough guys on the bench to fill his spot. In drum corps every person must contribute in order to be successful," Lewis said. Tucker and Lewis cite several common themes between both drum corps and athletics. Tucker listed "Commitment, time, lots of hard work, endurance, setting a goal and reaching it" as some of the common requisites, also noting that teamwork, persistent practice and learning to adjust were important steps toward improving in both drum corps and sport. Lewis described a different set of shared attributes. "Both hockey and drum corps require athleticism, discipline and hard work in order to do well," Lewis said, elaborating that "The mindset for both activities is pretty much the same. You work hard, contribute as much as you can, and be a team player." 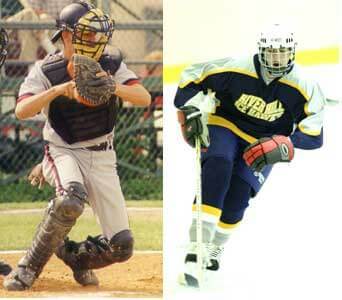 Lewis uses a hockey adage to keep both his athletic and drum corps lives in focus. "You'll hear a lot of hockey coaches say, "Keep your stick on the ice." This is pretty practical in terms of the sport itself but can be applied to anything you do. If your keep your stick on the ice, you're ready for the puck. If you stay focused and open in your life you're ready to take advantage of any opportunities that might come your way," Lewis said. Tucker, meanwhile, remembers one baseball anecdote that sums up both activities. "I can remember one time when it was really hot and I wasn't feeling too good during a game. I had to get out from behind the plate and throw up. Afterwards, I went right back to catching the rest of the inning and the game. It doesn't matter how good or bad you feel physically when you're doing something you love. You know that you are an integral part of the team and that you just have to do whatever it takes to get a win. Just like with drum corps. The days are long and hot and demanding physically, but I still get into uniform, march the drill with all the changes from that day and play my horn the best I possibly can every time, because I love drum corps and the Crossmen," Tucker said. Tucker also says his role as a catcher comes back to haunt him sometimes as a member of the Crossmen. "They say I jazz run like a catcher. At least I'm staying in shape in the off season!" Tucker said.